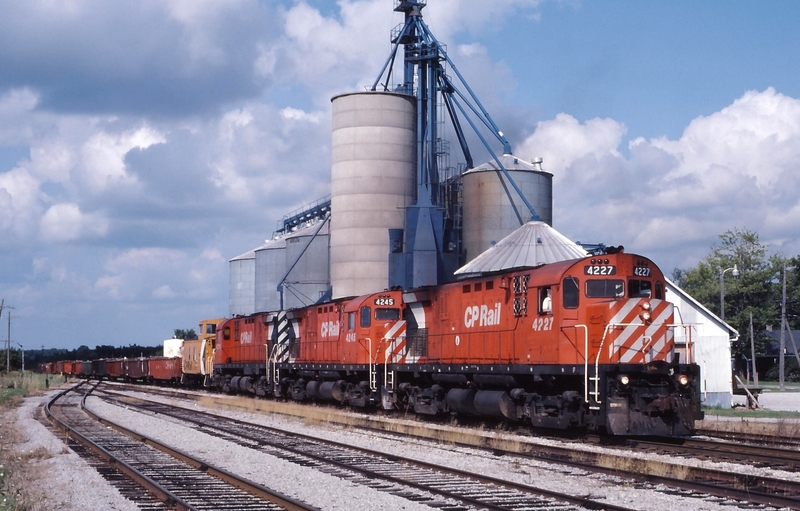 Railpictures.ca - John Eull Photo: The Hamilton to Nanticoke steel train took an odd routing when CP operated it half of the year. This train would originate on the TH&B, then travel over the CASO sub to Hagersville before switching to CN for the final leg to Nanticoke. Seen here on the CN Hagersville Subdivision.. | Railpictures.ca – Canadian Railway Photography – photographie ferroviaire Canadienne. Caption: The Hamilton to Nanticoke steel train took an odd routing when CP operated it half of the year. This train would originate on the TH&B, then travel over the CASO sub to Hagersville before switching to CN for the final leg to Nanticoke. Seen here on the CN Hagersville Subdivision..
John Congrats on making the Time Machine. Glenn Cherry reproduced this shot and posted it linking to yours. Many more to come no doubt! Great Shot John! Thanks for sharing these. I wish that I had been around to see the glory days of the CASO and the Hagersville Sub.